It’s here, it’s here!!! Welcome to the Week 4 Reveal of the $100 Room Challenge make over!!!! We have added a barn wood facia board to the front of all the existing wire shelves, purged the unwanted items and purchased new totes for storage. I just want to start with a before picture just to remind you of where we started this project the first week of January. Ugly wire shelving and linens not in the current rotation of our day to day home life. I will be honest, and tell you I know this is really not a horrific site, and most of America would love to have a linen closet this organized, but keep in mind that it can always be a little bit better. Are you ready for this? 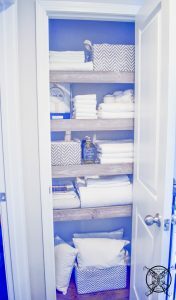 Check out how I made this space even better, a linen closet that I don’t cringe to open in front of anyone. 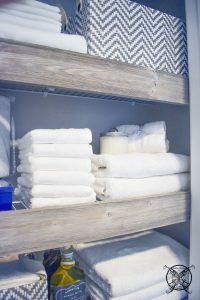 I really feel that the wood facia boards makes the closet look very custom, and by utilizing the totes you no longer see those sheet sets that can not be folded to perfection. You may also notice the gray and white color theme. I was able to purge out most of the mismatch items. The items I did decide to keep, that do not match this color story are neatly stored inside the opaque totes. This was one of the factors of picking these types of totes, while I love the wire baskets you could literally see everything inside of them. Which is not really doing anything aesthetically pleasing for this hallway closet. Yes I know, if it is all suppose to be gray and white, what is the blue first aid box doing in there? I will admit I had reservations about placing it in here too, but first of all it is vintage circa 1960 something, and has been in my family for years. Second, it is a First Aid kit!! Which needs to be readily accessible and easy to find, so that trumps design esthetics every time. Okay, so why did I opt to keep the wire shelves in stead just replacing them all with wood? Well budget is the fast and easy answer. Also, I like the idea of having wire shelves in a linen closet, because it keeps the air circulation moving through out. 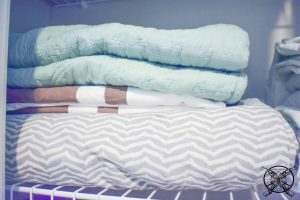 This helps to keep the sheets and towels from getting a musty stored away smell. I also added in a few scent sachets to help keep this linen closet always smelling fresh and clean. I left one out to scent the closet, and slide the other into the totes that contain the sheets, pillow cases, and throw pillows. A budget freiendly tip I picked up from my mom as a kid, is to take the free perfume samples sent in the mail via catalogues and place them inside the totes and drawers. As a child post depression era baby, she did not have much, her parents learned to be thrifty and so did she. Why spend $5 on a scent sachet when vendors send expensive perfume samples to you for free that you can hide in your drawers and totes. Do you remember me saying that I wanted the facia boards of the hallway linen closet to match my fireplace, since it was located directly across from the landing it was located on? Well here is the view of how this barn wood ties in to to create a very cohesive feel in two spaces that are in direct site line of each other. When designing spaces you always want to keep your site lines in mind, and how the spaces will flow into one another. This keeps you focused on the big picture. Do you think I made it??? Well of course I did, I actually came in way under and was able to add a few great things to freshen up the space even more. 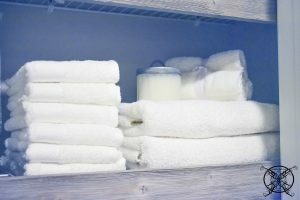 I also replenished a few towels as well since they were on sale at JC Penney, which is one of my go to spots for deals on towels. The Home Expressions 6 pc. 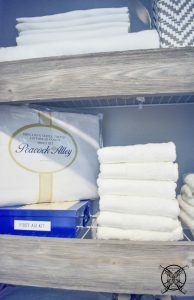 Solid Bath Towel Set at J.C. Penny’s with free shipping everyday anywhere over $99, or to stores over $49. 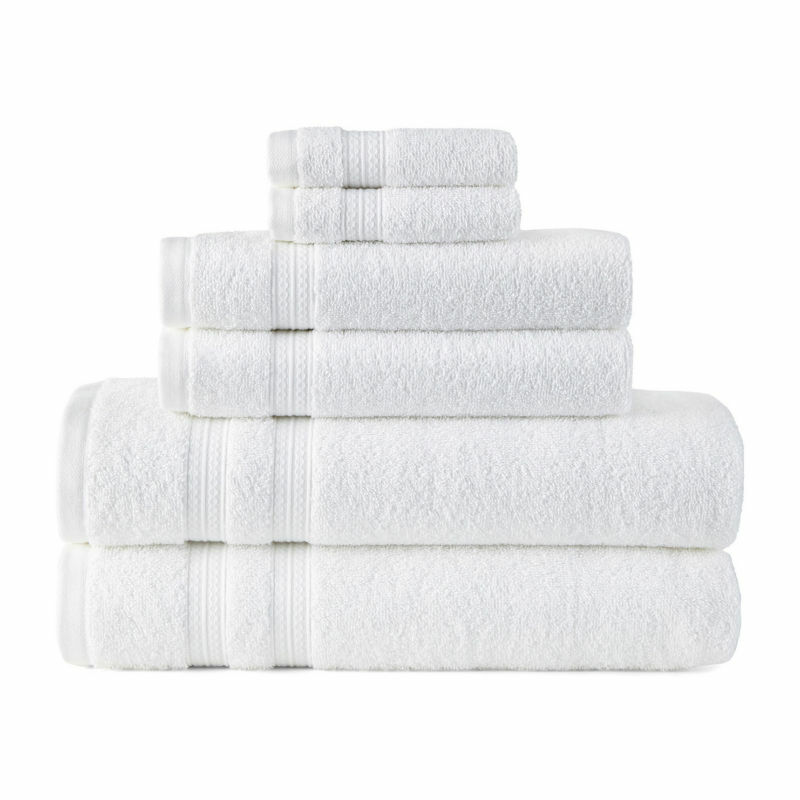 This is one of my all time favorites when looking for a good quality, affordable towels. You should take part in a contest for one of the best home decor blogs on the web. I will recommend this site! Wow! What a difference with very little cost! Your linen closet really puts mine to shame. Bravo you did such a wonderful job for under $100 you made a bunch of big changes to a very small space and really changed things up. I really like this challenge very much, and I feel like I really learned a lot of great design tips from you, thanks! I feel like I learned so much in these posts, what a great process, Cheers! I really got into this website. I found it to be interesting, great design tips and loaded with unique points of interest for a novice. An excellent read. It’s like you read my mind or looked in linen closet! I will certainly be back. I just read your last $100 Room Challenge and I really like what your accomplished with the linen closet. Those shelves really look amazing now, and for so little money, you are a decorating whiz. 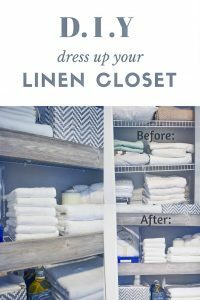 Love this Linen closet upgrade, and I have shared this link with my social media, great job. 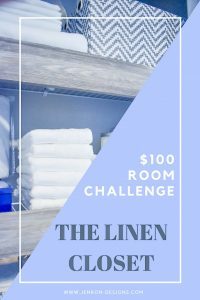 The $100 Room Challenge is among one of my favorite home challenges on the market. Your linen closet upgrade was a very nice addition last season. Thanks for sharing this information have shared this link with others please keep posting such wonderful information. After research a couple of of the blog posts in your website now, and I really like your method of blogging. I bookmarked it to my bookmark web site list and will probably be checking back soon. Thanks for sharing this information I have shared this link with others, keep posting such information. Spot on the mark with this challenge and your write-up, I really think this website warrants so much more consideration, thanks for that info. Wow! That was worth a read. Thank you much for sharing ! It is important that you pick the best style of Linens to fill your closet, we love what you have done with yours. 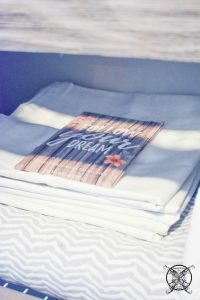 You have a lovely linen closet and it is so organized, you must do a tutorial on hold to fold a fitted sheet. Great post, I am so impress with this upgrade for under a $100, I like these challenges please do more. I really love this linen closet and the faux barn wood boards you added. This is such a simple upgrade and so impactful, but only such a tiny budget, LOVED this challenge, probably more than the ORC, because it is more obtainable. I officially have closet envy now, OMG this must be one of the pretest linen closets I have ever seen. You must do I follow up I have to know if it actually stays this way, add it to your Instagram stories or something. WOW! WOW! WOW! let it be known this is a fantastic idea and great project! Love the end results, so farmhouse fabulous! Hi there this entire post is wonderful. The theme is great the picture are clear and crisp. You stay on topic and provide your readers a great take away. Nice 4 part post. Oh my gosh I love this closet! It is everything I aspire to in my line closet. The baskets really made a difference and the boards are a great idea, I could not even stop reading that post, I was mesmerized. Bookmarking your site, I need you inspiration in my life on a regular basis. Wonderful project, I really do love how it turned out and now I want to do this with my hallway linen closet too! What a fun webpage this is! Full of helpful facts for us, please continue to keep it up. Marvelous, what a post this is! I have really loved it, please keep it up. This entire post was great and turned out so nice. You really did a great job color coordinating everything and making your linen closet so appealing to look at, which is quite a feat. I visited multiple pages this site is actually excellent. Love this challenge! You have a fantastic blog here! I know I would prefer you to make some invitation posts on my blog, what do you think? hit me up if you are interested. Another great post, this is one I can see myself doing over the weekend. I was so happy to seethes post! !.Thanks for your time for this excellent learning oppertunity!! I positively enjoying each little little bit of it and I have you bookmarked to check out new stuff you weblog post. I was very happy to see this with a tight budget, it makes the challenge a little bit more really than and endless budget or a whole lot of free things giving to bloggers by sponsors. I have you bookmarked so I can take a look at all your new stuff as it comes out. I love this post, you ladies always impress me with the $100 challenge. It is one of my favortie blog challenges online! This web site is really a great find for me. I love your style and ideas. I really liked this challenge and whole lot. It is so nice to see designer ideas in my price budget. Just wanted to say how much I really enjoyed this post. I love you creative spirit and eyer for design. I have really wanted to write you a quick comment and tell you how much I have been enjoying your blog since you started it. I have finally found the time and wanted to leave you a little note. Also I really enjoyed this challenge with the $100 budget, very fun. I get so much pleasure from studying your site and seeing what is considered to be a on point trend. I am pretty sure that many folks think the same thing. Keep up all your hard work! This web site is really a treasure trove of great ideas. Thank you for issues your posts as DIY and sharing these inspiring interiors with the design world. I got your newsletter and just had to see what projects you had going on. This is a new challenge for you and I wanted to tell you how much I enjoyed it. I hope you continue to do more $100 Challenges in the future, because this closet looks great! 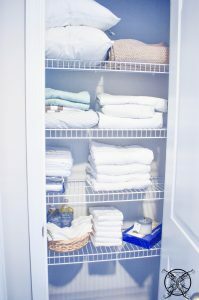 I really love the way your linen closet looks now, I only wish mine was that clean and tidy. I am pinning this as a goal for myself this month. Wish me luck. I needed you in my life, this is a really great idea. I love the $100 Room Challenge and all the inspiration it give me for my home. All that are completely do-able. You have so much originality it like a breath of fresh air every time I ope the next post. Plus you are so helpful by bringing new things new to the internet! Great idea, you answered my linen closet dilemma and now I have a great game plan to execute the perfect upgrade. Thanks. Thanks a lot of thanks for all your work on the entire website. You have been conducting a first class job for a new blogger and it has not gone unnoticed. I am still amazed at this transformation fo this space for like $50, wow! Can I just say how much I love this challenge, it is fun to see how you work within the perimeters of a tight budget. You did a fantastic job, I love that you just added a facia board to existing racks, brilliant. There’s noticeably a lot to learn about budget design. You make it look so simple and yet you spend very little money. This is something we all want, nice things at the best possible price. Thanks for keeping it real and being budget design friendly, since not everyone is bringing home 6 figures. 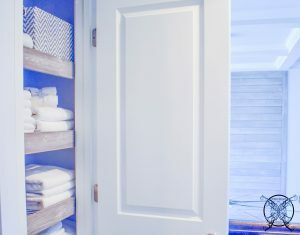 I have dreams of a linen closet that looks like this, after raising kids, I figured I would never see the day, but now I have high hopes. I really think this web site needs much more consideration from the internet as a whole. I will be back again to read much more, thanks for that info. I love your work it always inspires me so, thanks for being you. 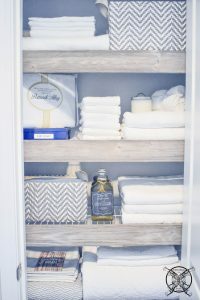 I have to express my appreciation to you, I am not sure what I would’ve done with my linen closet, if I had not come upon such a great ideas like this. Thanks a lot for your high quality and amazing guide. I love a pretty closet! What a huge transformation – The wood looks fantastic! Spot on with this write-up, I actually think this website needs far more consideration and more posts like this one. I think most people prefer a obtainable budget like this one. By the way thanks for that info. on the facia boards and shelving. Wow this turned out great! I wanted to show my gratitude for your kind-heartedness to have design ideas that fit into a average family’s budget. Thank you! Very nice post! I love the challenge of keeping it with in $100 that is a feat in and of itself. I definitely love this web site, keep on producing these types of wonderful posts. Thank you for providing me and other individuals with these marvelous design possibilities. I love that you took part in this challenge, it is really a fun one. I have been following it for a year or two, now and I always find the great inspirations here. Adding you to my rss feed so I can find you quickly, I have a feeling you have much more, where this came from. As I mentioned in my pervious comment I really do enjoy reading your blog. This challenge is wonderful and so affordable, which I believe is important to most of us. You created a efficient, yet beautiful upgrade to your linen closet that everyone will love. I am so impressed with this entire challenge, I have to say. I like the idea and concept and the implementation of your design. So happy to have I stumbled upon this in my search for one thing relating to this. I love your site, and try to make it out to see what you have been doing every few months. 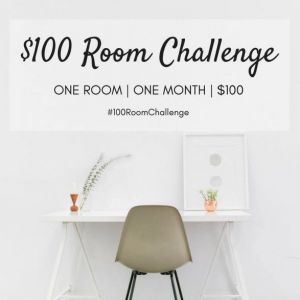 I just caught this 4 week post about the $100 room challenge. What a great idea and you did such a good job too! Many thanks for the linen closet inspiration. I was more than happy to see this challenge on your site. I wished to say thanks for your time for this excellent post!! I definitely having fun with every little bit of it and I love the $100 budget, such a obtainable goal. I have you bookmarked to check out new stuff you blog post through out the year. Bravo, this is a great design concept, and one that will surely catch on rather quickly. I know we all hate those ugly wire shelves. Thanks for all the information! Can I simply say what a great idea this is. You definitely know how to solve a problem and make it pretty. More individuals must read this and understand this concept. Oh my goodness! What an incredible article! Love the reveal and the low bidet restraints. Thank you! Thanks for all of your work on this web site. You have been performing a very good job. All I can say about his post is WOW! I want to redo all my closets now. Great post. I’m going to bookmark your site and maintain checking for brand spanking new information. Can I just say what a refreshing experience it is to find a blogger that actually is aware of what they are talking and keep in mind the average readers budget for these types of projects. You definitely know how to deliver an useful diy issue and make it important. More individuals need to read this and follow your blog. I can’t believe you are not famous yet, the next Joanna Gaines, heck your initials are the same. I would like to show appreciation to you for sharing my similar closet affliction. 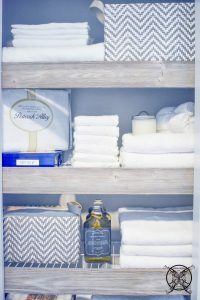 I also want a tidy linen closet, and this one makes me really happy. I think I will have to a facia boards like you did, because it really turned out very pretty. You made some first rate decisions there. I looked on the web for this design problem and found most individuals will associate with with your website. That is great! The $100 Room Challenge is the way to go for sure! Can I just say you always provide aid that I am seeking out. You are someone who really is aware of what they are speaking about on the internet. You definitely know how one can bring a problem to mild and make it important. I can not begingto tell your how many individuals must read this post and understand this aspect. I can’t imagine youre not more popular since you definitely have the gift of beautiful design. I am only writing a comment to make sure you understand what a magnificent experience I had at this blog. You have included wonderfully giving tips to make a number of people completely fully understand home design and budget as a subject matter. You have actually exceeded all my expectations. I appreciate you for rendering such valuable advice. Good post. I studied this post closely, since it is so affordable and looks great. Thanks for sharing. Ahhhh! I love how the wood looks! I have so much wire shelving in my closets and I definitely need to try this. Looks so good and organized! I found your blog website on stumble upon. Please know that I love it. The $100 Challenge is a great idea, so continue to keep up the excellent operation of your page. I just additional up your RSS feed to my MSN Information Reader.To hear more from you later on! A formidable share, I simply love that you are doing a $100 challenge. So let me reword that: Thnx for the treat and a design I could afford! Also for a project that is doable. Your expertise, and thoughts are so inspiring. It’s extremely helpful for me. 5 stars for this weblog submit! Thank you so much for providing individuals with an extremely useful tips from this website. It is always terrific and packed with amusement for me. And of course, I’m also certainly fulfilled with all the eye-popping ideas you inspire me with. You give so much to your readers, thank you. This is the proper blog for anyone who desires to search out out about closet design. Love that you did it all for under $100, You definitely put a brand new spin on this project. Nice stuff! Your post are invaluable to me. I love that you also compete in low budget decorating challenges too. I think most people are like me and might fine themselves on a fixed budget. We still like nice things and we could we easily set aside $100 a month to upgrade our homes. Just wanted to say thanks and love you blog! Your closet is gorgeous now! And I love that perfume sample trick – so smart! That wood trim was an awesome idea. What a difference it made and I love the baskets too. It’s amazing what a difference that wood fascia makes! And all those little baskets look great. It’s so nice to have a closet that you don’t cringe whenever you open the door! Erin thank you so much for inviting me to join this fabulous group!!! I really enjoyed the challenge and I am already looking forward to the next $100 Room Makeover in September!!! The wood fronts look amazing!!! Such a great idea. I want this to be my linen closet 🙂 You did a great job… and you came in under budget! So happy to have you join the challenge this month! That wood facia is genius. So much more cohesive and custom looking. I love love love this! Although most people would consider my linen closet very tidy, I feel the same way when I open it up and see those wire racks lol! I like how you kept the wiring (since it does promote circulation and prevent that musty smell) and just added the wood for ascetics, looks great. And it also makes total sense about adding the first aid kit where you did. Great post and thank you for sharing! Wow! You did such a beautiful job! I love your linen closet. So pretty! I love what you have done with everything. The totes are adorable. And this would be a great excuse to get new towels! I will have to remember that! awww, you made it under budget and it’s beautiful! Congrats!! I love the color pallet that you’ve used.